This level has medium difficulty. For this level try to play from one side or bottom to have more candies available to play. 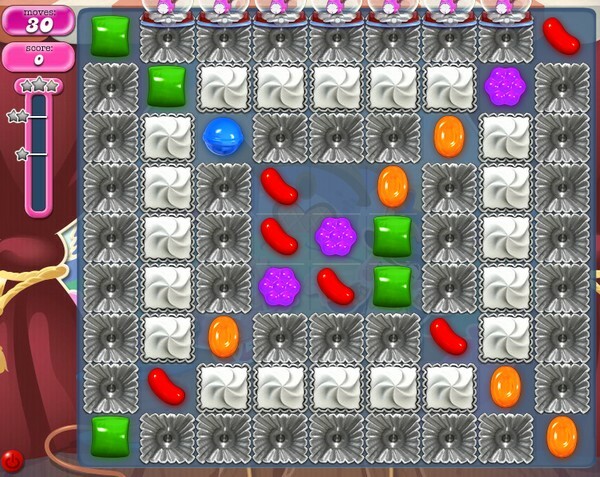 Make special candy and combine with other special candy to break more candies. The score is 400000 not 40000! Even with a great board and several color bombs I did not get close to that score. I usually do not get half that score. Another level king needs to adjust. Just make it fair and fun again. 400,000 points in 30 moves ??? Not posiible can I get a correction ? The walkthrough is 40,000 pnts in 30 moves. You would think on a board this size it would be easy to get lots of bonus candies and it’s not 🙁 came close once!! Thought this level was tough and was just hoping to get a good board, but then I discovered the way to get the most points is to MATCH A COOKIE with a BOMB!!! This gave me almost half the points. Once I realized this was they key, it only took me three tries to beat it! Are the cookies the multi coloured candy? YOU NEED TO MATCH A COLOR BOMB (MULTICOLORED CANDY) WITH A TIMED BOMB. ONCE YOU DO THAT YOU WILL SEE HOW EASY IT ACTUALLY IS. Yep, worked! Color bomb and time bomb. Had to try about 3 times, it worked. Have played for 3 years. This is the worst game I’ve encountered. I enjoy playing but I don’t even come close. Think I am done! Finally, I understood that Color bombs with regular candy gives a huge boost on points. 1898 completed! 1st board! Hmm!!!??? I had over 523,000 after 7 moves and I never combined anything!